Bruges is a well known city in Belgium, perhaps the most touristy and one of the most beautiful places to visit in Belgium and made famous by the movie “In Bruges”. Now it has another reason for fame - back in January it was reported that the city would build an underground pipeline to move beer through the city. One of the reasons for building this “beer tunnel” is to unclog the roads. At the moment around 500 trucks drive around with the sole purpose of transporting beer. An obvious eco friendly solution would therefore be to do this underground. The pipeline is reported to be 3 - 4 Km long and be able to move around 6000 litres per hour, or 8000 75cl bottles. One of the people involved in the project said they have thought of the fact that people may try to tap off some of the beer but the materials sed are so strong that this wouldn’t be possible. 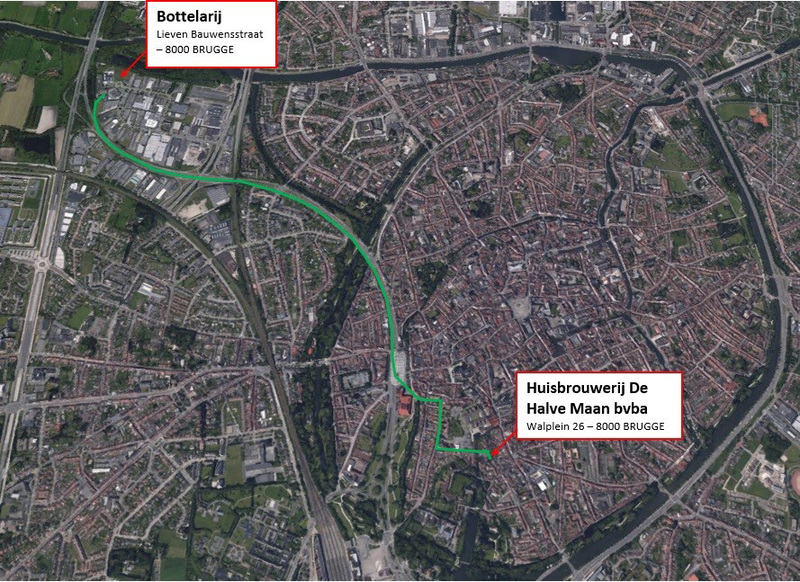 The pipeline will be running from De Halve Maan brewery to the bottling plant, around 3 Km further where it will arrive just 10 minutes later. De Halve Maan is known for brewing several fantastic beers such as “Straffe Hendrik” and “Brugse Zot”. They take pride in brewing these beers within the city walls and claim to always continue this tradition. Five years ago they opened a new bottling plant at “het Waggelwater”. There more labor intensive procedures like bottling and warehousing could thus be moved out of the centre of the city into a more suitable industrial area. Soon after they formulated this revolutionary idea of using a pipeline to transport the beer between their facilities. Now the brewery has started a crowdfunding project to finance the costs of the pipeline. In true crowdfunding style, incentives are offered to everyone who contributes. Anyone who contributes to the project between 15th of June and 31st December 2015 will be a part of the history of this famous brewery. Both companies and individuals can contribute. - For a contribution of 220EUR you get a personalised Brugse Zot glass and for the rest of your life you’ll get a 75cl gift wrapped bottle of Brugze Zot Blonde beer. - For a 800EUR contribution you get a set of 6 personalised glasses en for the rest of your life you’ll get a case of Brugse Zot Blonde on your birthday. - Finally for a 7500EUR contribution you get 18 personalised glasses and 1 33cl bottle of Brugse Zot Blonden per day (!!). You’ll also be invited as a VIP guest at the opening ceremony of the construction of the pipeline, as well as various other brewery related events.